Helmets, knee pads, shin guards…if you’re an avid athlete or the parent of one, you know the importance of proper protective gear. But did you know that up to 40% of all sports injuries involve the face? 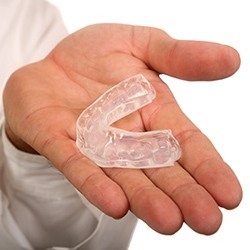 Protect your smile and your mouth with a comfortable, custom-molded mouthguard to dramatically reduce the risk of a sports-related oral injury. A mouthguard is a comfortable piece of athletic gear that fits over your teeth and can help protect your smile as well as your lips, tongue, face, and jaw. New research indicates that mouthguards can even reduce the severity of concussions. While hockey, boxing, and rugby players would obviously benefit from mouthguards, others, like bicyclists, weightlifters, and gymnasts also made the ADA’s list of athletes who need mouthguards. And, because the face is an important part of a person’s image, self-confidence, and sometimes success, it’s better to be safe than…toothless! Before facemasks and mouthguards were required in football, players had a 1 in 10 chance of sustaining a mouth injury. Once high schools and colleges began requiring facemasks and mouthguards, the number of injuries reported dropped by 200,000 per year. 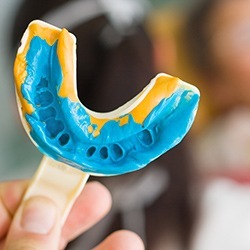 Naturally, dentists and the ADA recommend mouthguards for adults and children in any recreational activity that poses the risk of injury to the mouth. 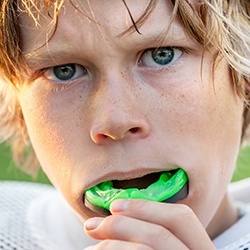 You may have seen ready-made mouthguards in a department or sporting goods store. These generic mouthguards are inexpensive and readily available. Unfortunately, because they are not custom-fitted, they may seem bulky and uncomfortable in your mouth. Ready-made mouthguards are secured by closed jaws which means, when an athlete wears a ready-made mouthguard, speaking and breathing may be difficult. If you’re looking for something that is more custom fit to your mouth, you might consider mouth-formed mouthguards. Acrylic, shell liner mouthguards provide a comfortable and secure fit over your natural teeth. Unfortunately, many users report that this mouthguard can have an unpleasant odor or taste. It can also harden over time and lose its flexibility. Another type of mouth-formed mouthguard, the thermoplastic style, can be customized by heating it in water, then biting it. It will take on the shape of your bite. While these maintain their flexibility, they can often feel bulky. 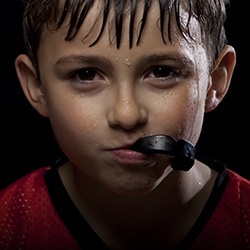 The best solution, custom-made mouthguards, are comfortable, practical, and protective. At Chaska Dental Center, we can create a custom-made mouthguard for you after taking impressions of your teeth. Not only will your mouthguard have a comfortable fit, but you can also customize the color. We currently have purple for the Chaska Hawks and Navy Blue for the Chanhassen Storm. Before you purchase any mouthguard, talk to your dentist. 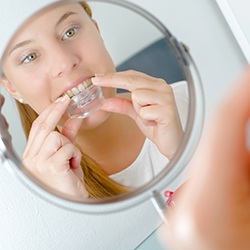 Special mouthguards or mouth protectors are recommended for patients with braces, removable bridges or dentures, a protruding jaw, or a cleft palate. Always wear your mouthguard during practice and games. Never chew on it because you may weaken the material and decrease its effectiveness. Holes, tears, and damage to the mouthguard may irritate your gums or soft tissue, so if you notice damage, replace your mouthguard immediately. Before and after each use, check your mouthguard for damage and rinse it with cold water or mouthwash. You should regularly clean your guard with a toothbrush and germ-killing solution. Be sure to rinse it well and store it in a firm, perforated container. Avoid placing it in direct sunlight or high temperatures. Most importantly, you should schedule regular dental checkups, including one right before the playing season starts. When you see your dentist, bring your mouthguard and discuss any problems or concerns you may have.